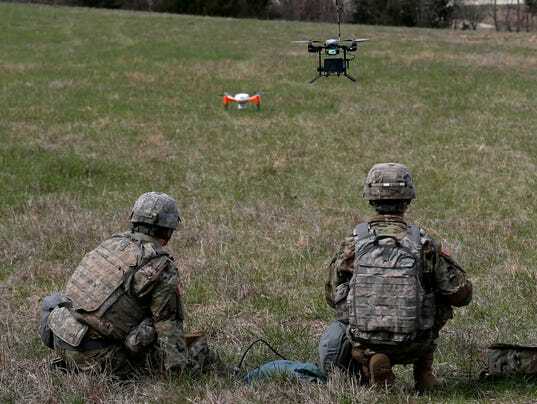 The Army demonstrated new technologies on Wednesday at Ft. Leonard Wood, during its Maneuver Support, Sustainment, Protection, Integration Experiment. In the near future, the U.S. Army hopes to use 3D printers to quickly build things like barracks and bunkers out of concrete. 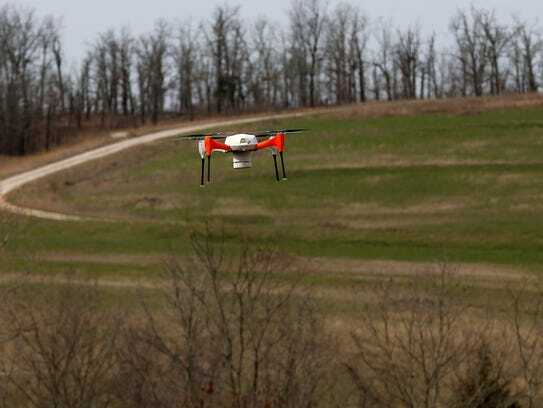 Drones equipped with tiny sensors could soon fly ahead of human warfighters to identify hot zones contaminated by deadly chemicals and gather other intelligence without risking lives. 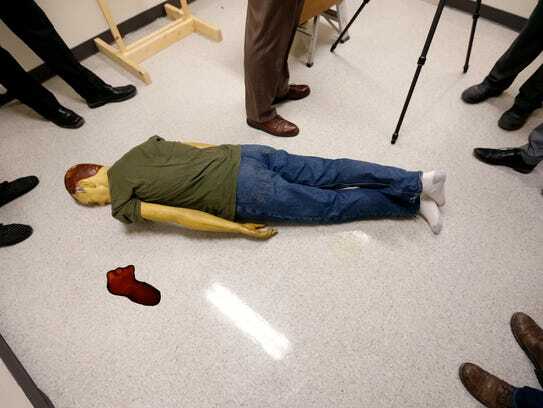 Scanner technology currently used by the most advanced law enforcement agencies to document crime scenes in 3D could find a use on the battlefield to allow mapping and route-making at previously unthinkable levels of detail. The United States is currently spending about $700 billion per year on military defense, and some of those funds are going toward technology testing in the heart of Missouri. Wednesday morning at Fort Leonard Wood, Army personnel showed journalists how they have been experimenting with new devices in recent weeks. It’s part of a program known in Army jargon as the Maneuver Support, Sustainment, Protection, Integration Experiment. The Army’s goal is to allow ordinary service members who might use new devices in a deployment scenario to have input before a new technology is declared field-ready. It is a strategy that has realized significant efficiencies for the U.S. military as it pushes to continually modernize, said Mike McCarthy, deputy to the commanding general for the Maneuver Support Center of Excellence at Fort Leonard Wood. McCarthy added that soldiers, who often leverage their own creativity as a matter of survival in the field, are also helpful in finding new uses for technology that might never occur to engineers in a design-lab setting. 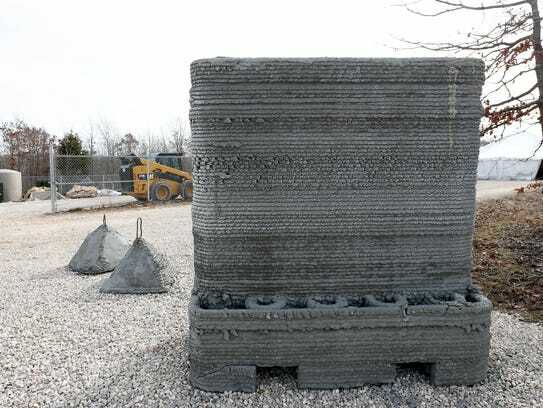 Megan Kreiger, a U.S. Army Corps of Engineers official based in Champaign, Illinois, was among those who demonstrated a 3D printing technology called ACES: Automated Construction of Expeditionary Structures. It is being developed by the Army, NASA and the Caterpillar corporation. Unlike a home 3D printer that might go on sale for Cyber Monday, ACES is the size of a largish garden shed. 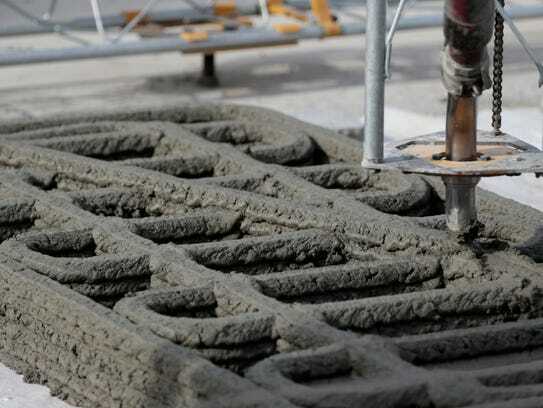 Instead of using plastic medium, it prints layer upon layer of concrete and aggregate in a process that Kreiger likened to frosting being piped onto a cake. She said that ACES has been in testing at Fort Leonard Wood for the past three weeks, the first time it’s been used outdoors and the first time it’s used “local materials” — in other words, the concrete that was available at Fort Leonard Wood, instead of the lab. So far, the device has been performing well under a variety of weather conditions, including cold, rainy Missouri spring weather, she said. This is the first time ACES has printed out a structure on an uneven gravel surface, which is notable because most 3D printers must have a perfectly flat surface before they can print. It only took 21.5 hours to print out a barracks hut suitable for housing 20 soldiers, she said. A simple bunker structure, complete with fortifying rebar, took only two hours to make with ACES. Before it can be used in a theater of war, Kreiger said that a “hardened” version of ACES needs to be developed that could stand up to a wide variety of weather conditions and be sturdy enough for transportation. The Army and the Corps would also like to develop an ACES technology that would allow soldiers to print out structures using dirt found on-site to form an “adobe-type brick,” rather than importing their own sacks of cement powder into a deployment area. Civilian applications of ACES technology would allow for “all kinds of things,” Kreiger said. For example, a factory full of 3D printers could print out prefab components for houses and other structures, Kreiger said, which could be assembled according to site-specific needs. ACES structures would be highly customizable, Kreiger said, since the machines print according to design data they’re given by human programmers. C-SIRP stands for Chemical, Biological, Radiological and Nuclear Sensor Integration on Robotic Platforms. Translation: Sensors miniaturized to fit in a space roughly the size of a can of cashews get mounted on the underside of quadcopter drones, then deployed ahead of human warfighters. 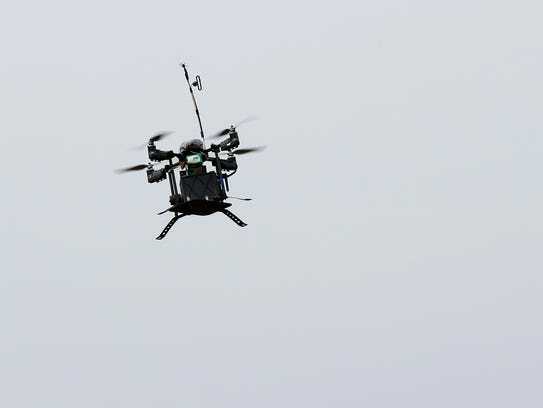 The Army showed off two types of C-SIRP drone on Wednesday: Deep Purple, designed and made by the government, and InstantEye, manufactured by Physical Sciences Inc.
Fiona Narayanan, who has worked on the development of Deep Purple, said that the goal was to leverage existing technologies — including LIDAR detection systems and encrypted video feeds — to help commanders made better decisions more quickly, lowering the risk to human life. The sensors can rapidly detect chemical contamination and other critical conditions in a deployment zone, allowing mission commanders to reconnoiter with less risk. To demonstrate the systems, Army personnel took about five minutes to unpack the drones from camouflaged backpacks that matched their fatigues. Meanwhile, a driver took a white minivan to the far side of a shallow valley on Fort Leonard Wood’s campus where the Army invited journalists to watch the C-SIRP demonstration. The van released a “fog oil plume,” in Narayanan’s words. Drone operators flew Deep Purple toward the plume. Where the smoke blew, the drone followed. It sent back real-time reports to a pair of large flatscreen TVs. FARO Focus Laser Scanners aren’t the same Faro as the murderous computer that plays a starring role in 2017’s Horizon Zero Dawn game for PlayStation 4. FARO is currently used by vanguard law enforcement agencies such as the FBI and New York City police department, said special agent Edward Wheeler. The scanners, which cost about $60,000 apiece, make 800,000 measurements in 3D per second, he said. That means law enforcement officers can use FARO to record data about a crime scene in around 40 minutes rather than taking two or three hours to measure everything by hand. Footprints, bullet trajectories, bloodstain patterns — “it scans everything,” said Dennis Sweet, an official with FARO Technologies Inc.
One advantage of this approach is that a 3D scan made the day a scene is discovered can yield additional data later on, if law enforcement officers decide they need to check for measurements they didn’t take on Day 1. The scan also allows for much less human error than, for example, capturing the distance between a body and a murder weapon with an old-fashioned tape measure. Staff Sgt. Christopher Schultz said that FARO Focus lasers are not yet used in a warfighting capacity, but that they could be valuable for 3D mapping or route-planning, for example. The devices can be mounted on robots or vehicles. Schultz said the FARO Focus can take 3D images while riding on a truck moving at 55 miles per hour, or even in complete blackness.